When I was in Hawaii recently, I experienced something that very few people ever get to experience. I went diving with a friend of mine who happens to be a shark research assistant, and he took me to an area that he knew was legendary for great white shark encounters. Well, believe it or not, we had an incredible adventure swimming alongside two great white sharks that afternoon. We were off the coast of Oahu when we spotted the great whites. One of them was about 18 feet long, while the other one was about 15 feet long. Just for your information, the average length of a great white shark is 11-21 feet. The two great whites had been swimming around the corpse of a dead whale. Close by, we also spotted three tiger sharks. I believe the tiger sharks were also keeping an eye on the deceased whale. They were all just an incredible sight. I was able to take several photos of the great white sharks and the tiger sharks, too. At one point, my friend was swimming parallel to one of the great whites, and I was able to capture a spectacular photo of the two of them. Apparently, my friend had had other opportunities swimming near great white sharks. On a previous trip, he had been swimming with great white sharks off the coast of Mexico. He said the ones that he saw there were not as big as the ones in Hawaii. In fact, the one in Hawaii was the biggest one that he had ever seen, and it certainly was bigger than I had ever seen. If you remember from one of my earlier journals, I ran into a great white shark off the coast of Australia. It was definitely much smaller in size than these two off the coast of Hawaii. There is something so awe-inspiring and scary at the same time about being in such close proximity with something so massive and intense. The movies that I’ve seen that had great white sharks in them do not do the real sharks justice. It truly was a breathtaking experience. I know I will never forget that afternoon. In such beautiful surroundings, at the beaches and coastline of Oahu, that we would come across something that is so formidable and intimidating as being up close and personal with two great white sharks. My friend also said that it was a good day for any shark researcher, and he plans to turn in his report and the photos that we took to his immediate supervisor. 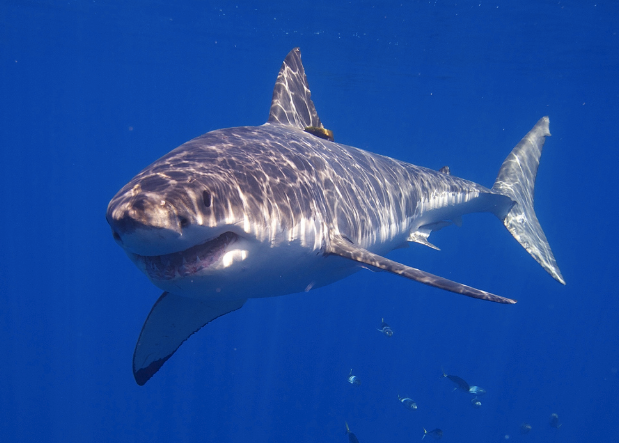 Be on the lookout for future articles regarding more research about great white sharks.